The sequel to Arlo Pro has officially arrived. Since people always say the sequels aren’t as good as the original, we wanted to test out the Arlo Pro 2 for ourselves. In this Arlo Pro 2 review, we will cover all of the new features, including CVR, motion zones, 3 second footage look back, and a wider viewing angle. For our testing, we set up Arlo Pro and Arlo Pro 2 right next to each other. The double security cameras got some strange looks from our visitors, but we felt this was the best way to test footage, audio/video quality, and alerts side-by-side. Now let’s dive into our full review. Watch the video below for examples of footage. The standard Arlo Pro 2 kit comes with rechargeable batteries, a base station with a built-in siren that connects to your router, an indoor power adapter and cable, and wall mounts. The base station is the same that comes with Arlo Pro. If you have the old Arlo base station, Arlo Pro 2 is also backwards compatible, so you could add the camera to your system without upgrading the base station. 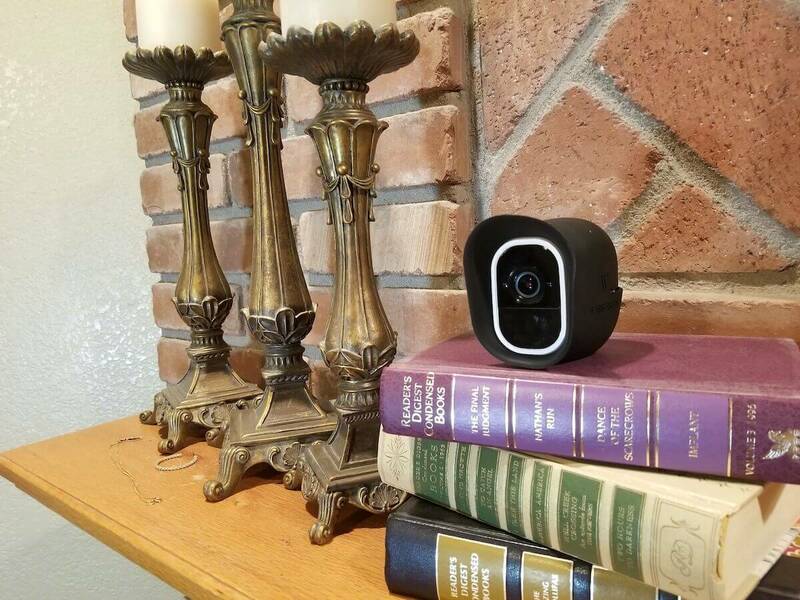 Setting up for our Arlo Pro 2 review was a breeze. Charge your cameras by plugging them into a power outlet. Press the button on the top of the base station to sync it with your cameras. Mount or install the cameras. There are plenty of indoor or outdoor Arlo Pro mounting options to choose from. Customize the modes and notifications you want to receive. Note that you may also need to plug in your Arlo Pro 2 into power. Most of the extra features that make Arlo Pro 2 better than the original require it to be plugged into an outlet. Make sure an outlet is nearby when selecting where to install the camera. Video quality on Arlo Pro 2 is 1080p, which is great for capturing faces and small details. The video options are Best Video, Optimized, or Best Battery Life; the highest quality footage drains battery faster. In testing for our Arlo Pro 2 review, the 1080p footage greatly improved the quality compared to Arlo Pro’s 720p footage. Since it’s a WiFi camera, it’s not as crystal clear as PoE cameras, but the footage could easily identify someone. The quality of footage is impressive considering it doesn’t require you to plug in a bunch of wires for installation. Arlo Pro 2 also has night vision, and it outperformed the Arlo Pro in our tests. Since Arlo Pro 2 has CVR while plugged in, the footage offers 3 second look back. This provides a few extra seconds at the beginning of the video. While it wasn’t a game-changer during our testing, it certainly added extra footage that would otherwise be missed. It’s nice to receive an alert when the courier is walking up to your door, rather than when they are already turning around and walking away. Arlo Pro 2 has a speaker and microphone, allowing you to talk back and forth with anyone in front of the camera. The sound quality was good and easy to understand overall. 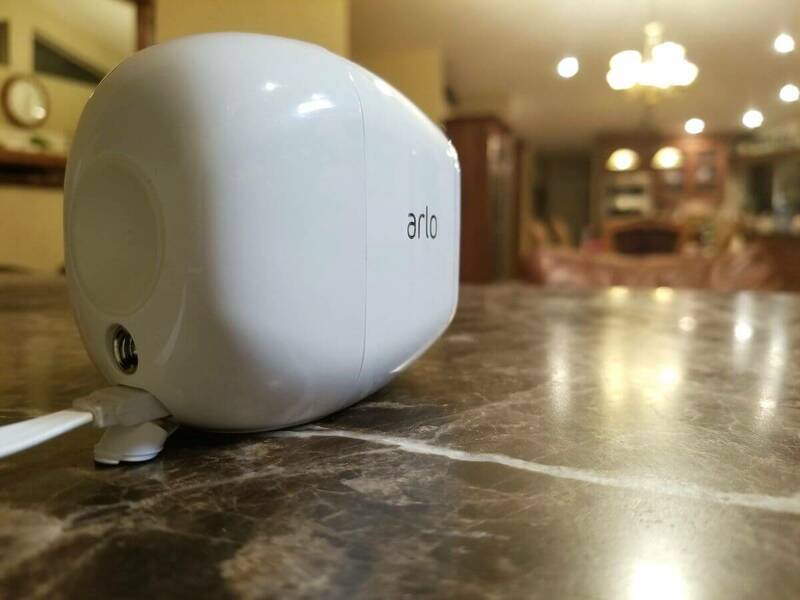 During our Arlo Pro 2 review testing, the speaker cut out a few times, but it was minor and will probably be resolved through a software update. The alerts are nearly instant, and we experienced nearly no lag time. Motion and audio alerts come as email or push notifications. You can specify which alerts you want to receive when setting up modes in the app. If you want to reduce the number of false alarms you receive, set up motion zones in the app. By drawing within the app, you can set up multiple zones for detecting motion, and motion in the rest of the camera’s view will get ignored. This eliminates extra notifications due to trees moving in the wind or cars driving on a nearby road. Arlo’s app is well designed and easy to use, with three tabs to change the mode, view the cameras, and review recorded footage. You can set up custom modes, or use some of the preset modes that come with the camera. A few modes might include armed, disarmed, geofencing, or bedtime. For example, when you’re at work you probably want your cameras all armed with the siren ready to sound on motion. But when you’re home, you will want the indoor cameras disarmed. On the Devices tab, you can view the live streams from your cameras, their battery life and connection, and individual camera settings. There are options for flipping over the camera image, which is great for if it’s hanging upside down. If you open up the live stream for your cameras, you can use two-way voice to talk back and forth with whoever is in range of the cameras. There is also a big button for manually turning on the siren in case of emergency. Finally, the Library tab is where you can view the last 7 days of recorded footage (or more if you’re on a paid plan). These are stored in the cloud until you download clips. The app has plenty of settings for customizing your Arlo experience. You can grant access to other users, specify the notification tone, name your cameras, and zoom in the camera. There is also camera positioning and motion detection tests to aid in installation. My only real gripe with the app is that it sometimes loads slowly. When I get a notification that there was motion at my front door, I want to quickly see what’s going on and talk back and forth with visitors. Initially loading up the app and live feed take a bit longer than is convenient, but it’s an understandable part of using WiFi cameras. Arlo Pro 2’s battery life is nearly the same as the original Arlo Pro: around 6 months. While some users online have found the battery to actually last around 3 months, this may be because they installed their cameras far from the base station. There are plenty of other factors that can effect battery life, as we explain in this article. We setup strategically for our Arlo Pro 2 review, with the Arlo Pro next to Arlo Pro 2 indoors and outdoors. The battery percentage remained the same on both cameras, whether inside or out. An indoor power outlet is included with the camera for recharging or consistently powering the Arlo Pro 2. While there used to be an outdoor power outlet for Arlo Pro 2, it was recalled by NETGEAR as a fire hazard. The external solar power option doesn’t work for these features either. For now, you can only plug in your camera indoors, or use it anywhere on a battery without these extra features. The batteries are proprietary and recharge very quickly. To recharge your Arlo Pro 2, just plug it into an outlet for an hour or two until it’s fully charged. You can also remove the batteries and install them on an external charging station as well. If you have extra batteries, you can ensure there is no downtime for your Arlo Pro 2 by swapping the one in the camera with the one at the charging station. Arlo Pro 2 is small enough to fit in your hand. It has a strong magnet on the back, making it easy to install since you can screw the magnetic mount to the wall and attach Arlo. The camera is white for battery-saving purposes, but adding a skin can easily camouflage it. Just like the original Arlo Pro, the new Arlo Pro 2 is weatherproof and can withstand the elements. Both cameras are the same size; the only difference we discovered during our Arlo Pro 2 review was the white trim on the front of Arlo Pro 2. I’m not sure why NETGEAR decided to add this because it really hinders the camera’s ability to blend in using skins. Here’s why we love Arlo: all of their cameras come with 7 days of rolling free cloud storage. You can set your cameras to record automatically on motion, and the last 7 days of clips will be stored for free. The free plan works for up to 5 cameras, and downloading clips is also included complimentary. Arlo Pro 2 has an upgraded feature of Continuous Video Recording (CVR). Instead of only capturing clips on motion, you can see a continuous timeline of footage. This improves the quality of footage you capture. With Arlo Pro, the cameras wake up when there is motion, causing them to miss that first split second of footage. Arlo Pro 2 with CVR has the camera always recording to catch all of the action. 14 days of 24/7 CVR will cost you $99 per year, per camera. Local storage is also offered in the base station if you plug in a USB. *These upgrades require the Arlo Pro 2 to be plugged into a power outlet. That’s a bummer since the outdoor power outlet is currently being recalled, limiting these features to indoor use. A white border around the front of the camera. It’s a small thing, but possibly an annoyance when trying to blend your cameras in using a skin. Possibly lower battery life on Arlo Pro 2. Since it has 1080p, Arlo Pro 2 supposedly has a 3-month battery life compared with Arlo Pro’s 6 month battery. We didn’t notice the battery life draining quicker than Arlo Pro. For this Arlo Pro 2 review, we found that it’s an excellent option if you’re wanting a 1080p wireless camera. 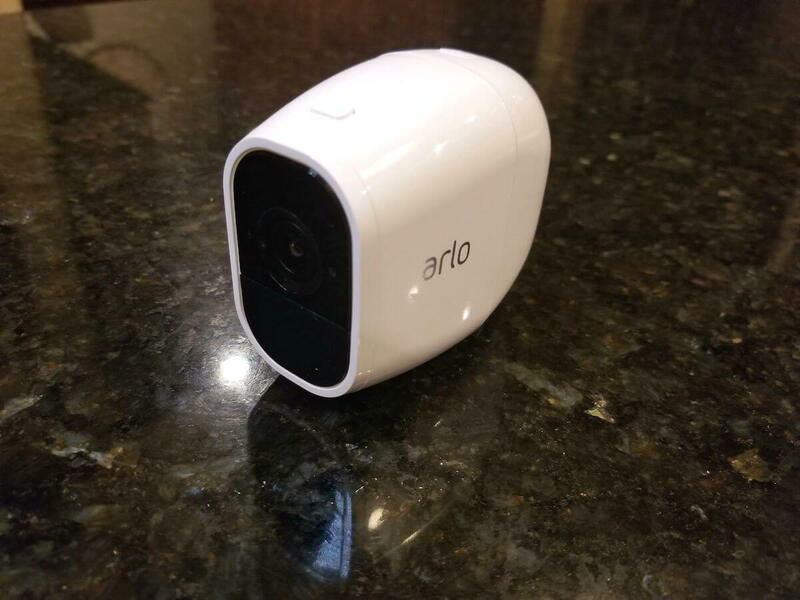 Its extra features like motion zones and 3 second look back make it very enticing as an upgraded version of the original Arlo Pro. While using these additional features outdoor will require a wait for the outdoor plug to be developed and re-released, the Arlo Pro 2 is a strong camera on its own in the meantime. At the very least, it’s great plugged in indoors until you can get your hands on the new power cord. What are your thoughts on Arlo Pro 2? Let us know in the comments below!